Community development organizations, which have historically focused on issues such as affordable housing and economic development, now face a new set of issues in the field of disaster preparedness. Fig 1. Disaster Planning Spectrum, Source: Author. Incorporating resilience into a proactive approach to planning requires considering the pre-disaster state and planning for a more desirable post-disaster state. “Bouncing back” from a disaster is a popular narrative, but the politics of resilience begs the question, what if the pre-disaster state is an unjust and unequitable socio-economic system?¹² The popular quote, “a crisis is a terrible thing to waste,” by noted economist Paul Romer, holds true in this instance.¹³ The planning process before a disaster provides an opportunity to either address inequality or reify the existing power structure. If resiliency planning focuses on equity, resilience investments can improve “the life circumstances of the most physically and socio-economically vulnerable residents” in addition to preparing for future disruption.¹⁴ Viewed in this light, community development practitioners, who sit at the nexus of multiple interconnecting forces — economic, social, environmental, and physical — seem to be uniquely positioned to carry out such work. Rather than planning to “bounce back,” they can plan to “bounce forward” towards a society that is more resilient, equitable and just after a disaster strikes. As scholars have shown, leveraging resilience methods to address underlying socio-economic issues is an ideal way to better communities, particularly rural communities, where a small number of organizations provide a diverse array of services.¹⁵ Few organizations, however, have pursued this approach in a systematic way. My survey of rural NeighborWorks network organizations revealed a spectrum of disaster planning efforts. 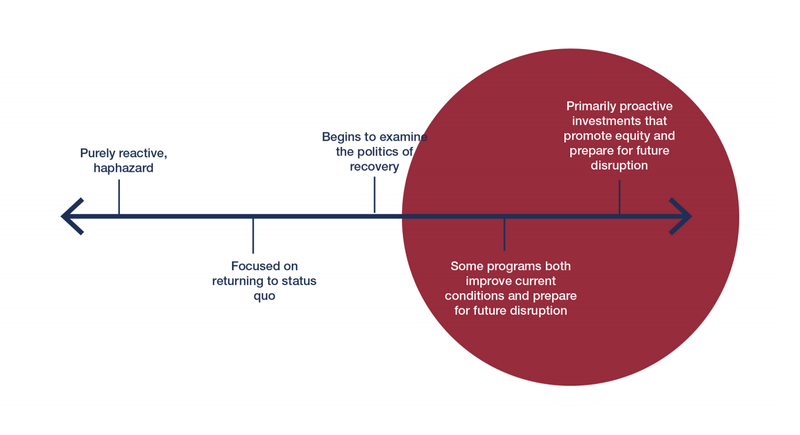 They ranged from reactive, haphazard responses in communities that had experienced a disaster to proactive plans in communities that leveraged investments both to promote equity and prepare their future disaster response. Such Proactive communities establish processes for disaster response that are mindful of equity concerns while also creating space for flexibility and reaction to a disaster’s impact. This research focused on the right half of the spectrum below, as indicated with the highlighting circle. What characterizes the approaches of organizations that have proactively planned for disruption while confronting existing inequalities? The case study of Community Development Corporation Brownsville in Texas (CDC Brownsville) illuminates how practitioners can leverage resilience investments for the most vulnerable people in their communities while also preparing for and responding to natural disasters. Not surprisingly, many Brownsville residents were upset by this response, and Texas RioGrande Legal Aid sued FEMA on behalf of La Union Del Pueblo Entero (LUPE), a community-activist group, and several homeowners over the denied claims and the decision-making process that identified properties with deferred maintenance.¹⁹ In February of 2017, after eight years of litigation, U.S. District Court Judge Hilda Tagle ruled that FEMA acted illegally when it invoked deferred maintenance and that it needed to reconsider the originally denied claims²⁰. While a satisfying win, the legal fight required significant time and resources and did not provide assistance to people in need in a timely manner. During the years that the case had been wending its way through the courts, CDC Brownsville (CDCB), a nonprofit community housing development organization that has been providing safe, sanitary affordable housing to the lower Rio Grande Valley of Texas since 1974, had been trying to change the paradigm for disaster response.²¹ The group’s leaders believed the then-current model of disaster response had serious shortcomings, such as the amount of money spent on temporary emergency shelter, the delays experienced by families and individuals waiting for recovery funds, as well as the amount of time spent redesigning the wheel after a disaster hit. RAPIDO’s impact does not stop with the built environment. Because the program is based on a bottom-up, community-based approach, CDCB and partners needed local program administration as well. A critical aspect of the RAPIDO model is intensive case navigation, which provides supportive outreach and case management throughout the process by assigning a “Navigator” to each family.³⁰ Navigators work with families from start to finish and serve as their main point of contact, connecting them to appropriate disaster recovery social services and making the process less intimidating.³¹ Navigators are experienced, trusted community members, and their involvement ensures a culturally and linguistically appropriate support service for natural disaster survivors.³² Rather than an unknown bureaucrat located far away, families can work with a person they know and trust. The Navigator — LUCHA relationship is an excellent example of how CDCB leveraged an initial resiliency investment, the Navigator position, to address inequity. The colonias now have a new cohort of activists ready to advocate for and improve their communities. The final component of RAPIDO is a pre-procurement and pre-contracting process that occurs in advance of a natural disaster and doubles as a local economic development stimulus. RAPIDO emphasizes the importance and necessity of pre-procurement, organizing all of “the necessary partners, MOUs, communications, payments, supplies, policies and procedures” before a disaster hits so that the recovery process can begin as soon as possible; pre-procurement became a priority for RAPIDO after the delayed response Brownsville had experienced in the past.³⁵ CDCB approaches the procurement and contracting process from a hyperlocal perspective, and they use 100 percent local labor to design, build, deliver and assemble the CORE and its additions.³⁶ In addition to jumpstarting the physical recovery after a disaster, the local labor emphasis provides job security during an uncertain time. Residents who were displaced by the storm or temporarily evacuated are assuaged of their fears that there will be no work when they return. Local businesses and their employees will also have a reason to come back to the community. Just as each component of RAPIDO builds upon itself and addresses inequity in the colonias in multiple ways, RAPIDO itself has cascaded and created a spin-off: MiCASiTA, a program that deploys the CORE in non-disaster situations as an affordable homeownership opportunity. A partnership between CDCB, Rio Grande Valley MultiBank (RGVMB), bcWORKSHOP, and Texas State Affordable Housing Corporation (TSAHC), MiCASiTA provides assistance to people living in dilapidated housing who earn less than 60 percent of the area median income.³⁷ By deploying a slightly altered version of the CORE with affordable financing options, MiCASiTA provides a path to owning a healthy, energy-efficient, safe home for families that traditionally would not be able to afford it. The creation of a new program that promotes the core tenets of RAPIDO outside of a disaster context exemplifies how CDCB has leveraged resiliency investments to create a more equitable community. The obstacles faced by RAPIDO’s expansion across Texas have not stopped CDCB from sharing their innovative work around the country. Their work has been showcased at the UN-Habitat Workshop, and in New York City at the Cooper Hewitt Smithsonian Design Museum’s exhibit “By the People: Designing a Better America.”⁴¹ RAPIDO demonstrates that it is possible to leverage resiliency investments for long-term benefits to communities in the aftermath of a disaster. This is just one example of rural community development organizations trying to carry out their traditional roles in the fields of housing and economic development while also expanding their work to include preparing for future disruptive events. The case study of CDCB suggests several principles about what such work entails in practice. In Brownsville, CDCB created infrastructure that served multiple purposes and was important in both pre-disaster and post-disaster conditions. The social infrastructure of the Navigators served a critical function in the post-disaster, RAPIDO response by guiding families through the recovery process as trusted members of the community. With community organizing skills learned through RAPIDO, Navigators have mobilized outside of a disaster context as well, advocating for colonia needs such as street lights and stormwater drainage. 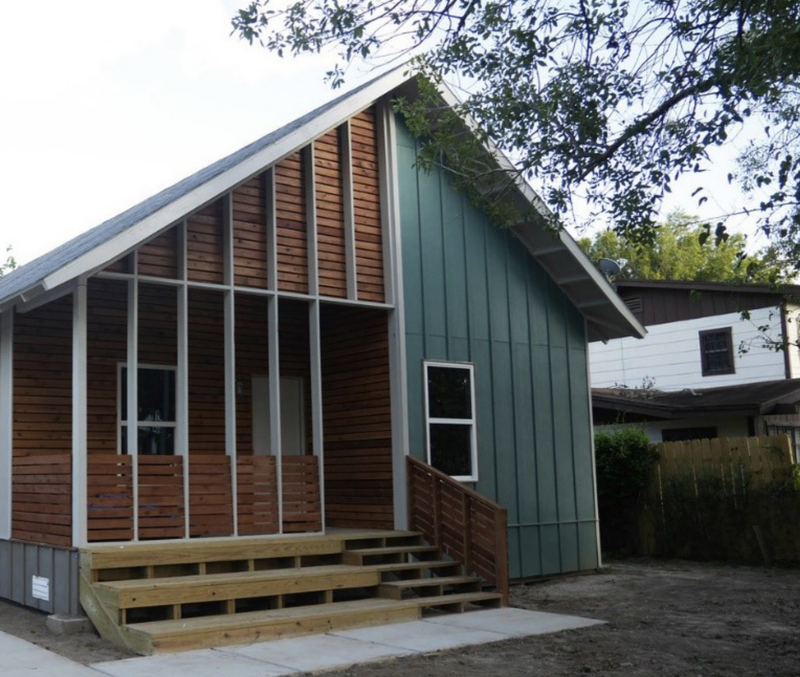 From a physical infrastructure perspective, RAPIDO’s CORE unit, originally intended for deployment after disasters, doubles as an innovative strategy to provide affordable housing to low-income families. The MiCASiTA program described above differentiates itself from traditional manufactured housing by including families in the design process and by offering ways to expand upon the basic unit of the house as the family gains financial stability. MiCASiTA transfers the benefits of the CORE into their community development work, giving the CORE purpose in both pre- and post-disaster settings. The “ratchet effect” theory, which holds that a disaster depletes the community’s resources and reduces its ability to recover from the next shock or stress, gained traction in the field of disaster studies in 2003.⁴² A disaster signals the first step in a community’s decline. Resiliency investments that address present-day issues and future risks in tandem counter this narrative and sow the seeds for greater equity within a community. Similar to fireweed, a pioneer species found in the American West that is critical to an ecosystem’s rebirth after a wildfire, incorporating current equity issues into disaster preparation and response is a crucial preliminary step to a community’s healthy regeneration. In 2017 Hurricane Harvey ravaged Houston and Hurricane Maria devastated Puerto Rico, and the next natural disaster is just around the corner. Considering the destruction these events wreak on people’s lives, resiliency is far more than a buzzword of the moment. The urgency of climate change is unrelenting, as are the social justice issues that accompany it. As we have seen, innovative rural organizations have recognized the connection between the climate and the social and therefore planned for disaster with both in mind. CDCB embraced the tension between addressing present needs and preparing for future events in their disaster preparedness approaches. Moving forward, researchers need to evaluate the effectiveness of this type of planning approach. CDCB is rooted in a mission to rebuild a more equitable and just society after a disaster, but is it successful? What are appropriate metrics to measure success? Are urban communities, particularly cities like New York and Houston that have been struck by high profile disasters, focusing on equity in their disaster planning efforts? How do these efforts compare with the work of rural communities? If a disaster really is a terrible thing to waste, then gaining a more comprehensive understanding of programs that address the social and the physical through resiliency planning, as well as of their effectiveness, is critical work to ensure future disasters are not lost opportunities. Katherine Swenson is a nationally recognized design leader, researcher, writer, and educator. She is vice president of Design at Enterprise Community Partners, where her work investigates how critical design practice promotes economic and social equity, environmental sustainability, and healthy communities. Swenson has led the Enterprise Rose Fellowship program since 2007, is on the board of MASS Design Group, and is a 2019 Loeb Fellow at the Harvard Graduate School of Design. She has written extensively about design activism and community design. As I write, the Carolina coast is awaiting landfall from Hurricane Matthew, while many in the community are still recovering from the devastation of Hurricane Florence. Indeed, the constant threat of climate related challenges is upon us. Questions of what makes a community resilient have never been more important, both in terms of how to prepare and how to respond, and perhaps mostly importantly, what motivates us to stay? I recently visited the community of Thunder Valley in Pine Ridge, a Lakota reservation in the southeastern part of South Dakota. Dramatically vast and beautiful, the Pine Ridge Indian Reservation has recently come to be known primarily by its debilitating poverty, sometimes ranked as having the poorest population in the country. What I witnessed there, however, was one of the most resilient communities I have ever met: a people drawing strength and guidance from their spiritual and cultural connection to their land, language, and history. New housing is being built, as well as the first community gathering place, while economic development and language initiatives are underway. If we look at the question of “what keeps people in a place” in the face of systemic traumas or repeated natural disasters, it is the connection of people and place. We are attached to our place, our home, because of the love we feel for the natural geography and to the people by our shared cultural traditions. Cultural resilience and climate resilience are inevitably linked. Love for a place, and connection to one’s neighbors fuels the commitment to build back better. Incorporating cultural practices into climate resilience strategies through investing in the creative identity of a community can have a profound impact on that community’s ability to not just survive but thrive in the face of disaster. When thinking about strategies for resilience, it is important to acknowledge the holistic nature of the term. Resilient solutions should address economic, social, and cultural resilience, as well as resilience to trauma. Community development groups and their partners are stepping into this breach by identifying natural disaster risks, building emergency plans, retrofitting and designing resilient buildings, preparing staff to handle emergencies, and ensure residents remain safe. When disaster strikes, communities need to get rebuilding started quickly. Quick action and a sense of progress are empowering and allow people to heal. Slow action and delay create a sense of immobilization that locks in the trauma of the event. Equally important is the need to respond and rebuild in a way that is responsive — taking the specific needs of families and communities into account. RAPIDO does both of these — allows for a quick response in the moment of crisis, but provides an adaptive solution that empowers the family to define the shape of the building to meet their long terms needs. In responding to the urgent need to rebuild housing, Brownsville CDC and its partners, developed a smart and effective strategy with their RAPDO program. They not only allow residents to get back into safe and affordable housing, but they also by engage them in the design process. Providing the opportunity for families to make choices and be empowered to be a part of the rebuilding process does more than just give them a much-needed housing solution; it starts the healing process of the trauma of displacement. Building trust by equipping people to understand the system and how they can manage through the rebuilding process supports the feeling of inclusion that connects people to their place. Donald Wuebbles, David Fahey, and Kathleen Hibbard, “Climate Science Special Report (CSSR)” (Washington, D.C.: U.S. Global Change Research Program, 2017). Simin Davoudi, “Resilience: A Bridging Concept or a Dead End?” Planning Theory and Practice 13, no. 2 ( June 2012): 299–333; Lawrence Vale, “The Politics of Resilient Cities: Whose Resilience and Whose City?” Building Research and Information 42, no. 2 (2014): 191–201; Susan Fainstein, “Resilience and Justice,” International Journal of Urban and Regional Research 39, no. 1 ( January 2015): 157–67, esp. 166. Morris A. Bender et al., “Modeled Impact of Anthropogenic Warming on the Frequency of Intense Atlantic Hurricanes,””plainCitation”:”Morris A. Bender et al., “Modeled Impact of Anthropogenic Warming on the Frequency of Intense Atlantic Hurricanes.” Science 327, no. 5964 (2010): 454–58. Jerold Kayden, “Resilience, Sustainable Development, Climate Change, Natural Disasters,” presented at the Land Use and Environmental Law, Cambridge, MA. November 29, 2017; C.S. Holling, “Resilience and the Stability of Ecological Systems,” Annual Review of Ecological Systems 4 (1973): 1–23. Holling defines resilience as “a measure of the persistence of systems and of their ability to absorb change and disturbance and still maintain the same relationships between populations or state variables.” He differentiates between engineering resilience, which he defines as “the ability of a system to return to an equilibrium or steady-state after a disturbance,” and ecological resilience, defined as “the magnitude of the disturbance that can be absorbed before the system changes its structure.” In engineering resilience, there is one equilibrium within the system, and the faster and more efficiently the system bounces back to it, the more resilient the system. Ecological resilience, on the other hand, has multiple equilibria — both a pre-disturbance equilibrium that the system may bounce back to and multiple post-disturbance equilibria that the system may bounce towards depending on the degree and extent of the disturbance. Nandini Gunewardena and Mark Schuler, eds., Capitalizing on Catastrophe: Neoliberal Strategies in Disaster Reconstruction (Lanham, MD: AltaMira Press, 2008). Christine A. Bevc, “Introduction to Conceptual Insights and Applications of Resilience,” in Disaster Resiliency: Interdisciplinary Perspectives, ed. Naim Kapucu, Christopher V. Hawkins, and Fernando I. Rivera (New York: Routledge, 2013), 15–21, esp. 17. Libby Porter and Simin Davoudi, “The Politics of Resilience for Planning: A Cautionary Note,” Planning Theory and Practice 13, no. 2 ( June 2012): 329–33, esp. 332. Lawrence Vale and Thomas J. Campanella, eds., The Resilient City: How Modern Cities Recover from Disaster (New York: Oxford University Press, 2005). Vale, “The Politics of Resilient Cities,” 196. Colonia means “neighborhood” in Spanish, but in the United States it has come to evoke an image of informal settlements with conditions more likely to be found in the Global South than in the Global North. The Texas Secretary of State defines a colonia as an “area along the Texas-Mexico border that may lack some of the most basic living necessities, such as potable water and electricity, paved roads, and safe and sanitary housing.” See Ryan Holeywell, “Colonias in Texas: Third-World Conditions, Slowly Improving,” Houston Chronicle, July 17, 2015, sec. Gray Matters. for more information. Elaine Morales, “Rapido Presentation,” presented at the Habitat III Conference, Quito, Ecuador, October 19, 2016. John Henneberger, “Current FEMA Disaster Recovery Policy Will Leave Low-Income Hurricane Survivors Unassisted,” Texas Housers (blog), July 1, 2010. Cameron Langford, “Legal-Aid Groups Fight for Texans’ Disaster Relief,” Courthouse News, September 29, 2017; Gary Long, “FEMA Loses Dolly Battle; Disaster Aid Sparring Ends after Eight Years,” The Brownsville Herald. February 23, 2017. 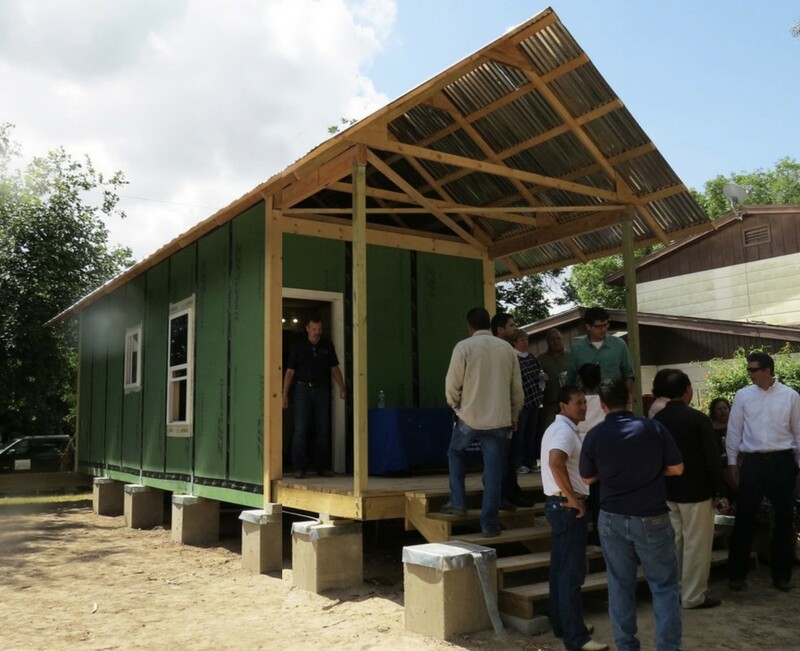 Hazard Reduction and Recovery Center at Texas A&M University et al., “Rapid Disaster Recovery Housing Program” (CDC Brownsville, January 2015). CDC Brownsville and bcWORKSHOP, “Technical Guide: Rapid Disaster Recovery Housing Program” (CDC Brownsville, 2015), v.
Jeremy Stremler, interview by the author, July 28, 2017. It is important to note that these homes are rebuilt on the same land that was impacted by the storm. The Rio Grande region and Brownsville, Texas will continue to be vulnerable to hurricanes in the future, but RAPIDO is not a managed retreat program. The relocation of residents is an interesting topic in the resiliency field, but it is outside the scope of this program and this paper. Ross Ramsey, “Analysis: Sorry, Your Bill Is Probably Dying,” Texas Tribune, May 8, 2017. Mark Pelling, The Vulnerability of Cities: Natural Disasters and Social Resilience (London: EarthScan, 2003), 16. A student-run publication investigating the intersection of real estate, technology, and design. We foster collaborative conversations between students and industry professionals to explore solutions to contemporary urban issues.